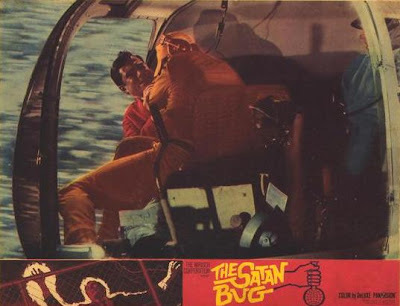 The end of all life on earth has never been more thrilling than in director John Sturges’ THE SATAN BUG (1964). Well, maybe not the end of all life, but the very real threat of it certainly gets a helluva hand-wringing, sweaty-palmed, chiller-diller cinematic workout . Based on the 1962 novel by adventure/mystery master Alistair MacLean (author of THE GUNS OF NAVARONE, WHERE EAGLES DARE and ICE STATION ZEBRA … here writing under the pseudonym “Ian Stuart”) BUG is one of those wonderful ironies we so love at the GullCottage: a smashingly well made, critically acclaimed major release from a major studio, with a cast and crew at the top of their game; and which would go on to not only give birth to but continue to influence a popular genre (in this case the “techno thriller” later popularized by Michael Crichton) decades after it’s release. It would also be prophetic in it’s anticipation of that most disturbing brand of real world militant political activism - bioterrorism. Yet in spite of all this it would somehow find itself as an obscure film (Leonard Maltin calls it an “overlooked little suspense gem”) of which most people today are barely aware. Pre-dating later biotech suspensors such as THE ANDROMEDA STRAIN, OUTBREAK and CONTAGION, THE SATAN BUG wasn’t the first such narrative. Columbia’s 1959 “B” movie programmer CITY OF FEAR (directed by Irving Lerner) detailed the race against time to find an escaped San Quentin convict who steals a case he believes contains heroin, but is actually filled with Cobalt 60 radioactive material which he leaks all over LA. 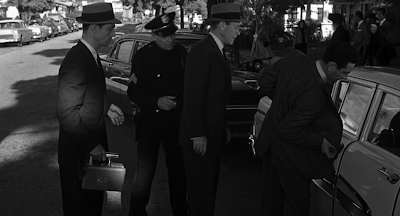 And the 1963 episode of THE ALFRED HITCHCOCK HOUR - “DIAGNOSIS: DANGER” would fashion a similar story about an anthrax scare. 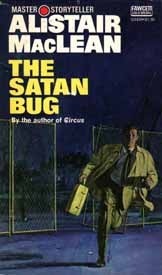 But THE SATAN BUG (book and film) was the first time such a plot was told not as pulp adventure, but with an exhaustive degree of detailed, real world verisimilitude such as to border on docu-drama rather than sci fi. The film version opens with former U.S. intelligence operative Lee Barrett (George Maharis - fresh off his popular run on TV’s ROUTE 66) pulled out of retirement to spearhead an investigation into the murder of an intel agent and disappearance of a scientist - both of them from “Station 3”, a bio-weapons facility in the California desert for which Barrett himself once headed security until quitting in disagreement over experiments conducted there. Barrett discovers two genetically altered “super strains” have been stolen from the lab: one an Ebola-like form of botulinus which oxidizes then dissipates eight hours after being released, and another nicknamed “The Satan Bug” which refuses to oxidize and can therefore, if released, spread unchallenged across the globe, creating a viral plague of biblical proportions (… and keep in mind this was over a decade before the first outbreak of Ebola hemorrhagic fever in 1976). Determining the thief or thieves had an “inside assist” from someone working within the lab, Barrett finds the “assist” dead in his own swimming pool, murdered by those who paid him. A short time later Barrett and his superiors receive a call from Charles Ainsley, a self-styled Howard Hughes-like millionaire crackpot “philanthropist” with no fixed address as he travels the world. Ainsley claims responsibility for the theft and offers the ultimatum “Mankind must abolish war, or war will abolish mankind”. Ainsley will see to mankind’s abolishment; and in possession of “The Satan Bug” he has the means to back his threats. He stages a “demonstration” (seen as a chillingly real piece of black and white newsreel footage) - releasing a sample of botulinus in Florida which kills masses before dissipating. And he’s hidden vials of the more lethal “Satan Bug” somewhere in Los Angeles. Following a thread of clues (including a State Trooper report of a Station 3 car broken down and abandoned in the desert), Barrett’s investigation leads him to two of Ainsley’s hired assassins (MARY TYLER MOORE SHOW’s “Lou Grant”/Ed Asner, and GOMER PYLE’s “Sgt. Carter”/Frank Sutton … years before either series existed). En route to a rendezvous with Ainsley, the killers are cornered by Barrett and FBI at a desert rest area, and they attempt to escape by opening a canister of botulinus. They're gunned down, the spread of the virus is contained by burning down the rest area structure, and when Ainsley arrives Barrett discovers the true identity of the bio-terrorist madman - one of the film’s biggest surprises. Born in Glasgow, the Scottish Gaelic Alistair Stuart MacLean (1922 - 1987) learned English as his second language, joined Britain’s Royal Navy in 1941, then during WW2 saw action in the Atlantic, Arctic, Aegean and Far East as an Ordinary Seaman, Able Seaman and Leading Torpedo Operator. After the war he studied English at the University of Glasgow then became a school teacher. To help “ends meet” during his university years he’d write numerous short stories, eventually winning a competition in 1954 for the sea-based “Dileas”. Asked by that story’s publisher for a novel he responded with H.M.S. ULYSSES (1955), and when it became a worldwide best seller, MacLean was then able to write full time. Based on his WW2 maritime experiences, ULYSSES would set the narrative paradigm for the best MacLean stories to come, those blending fact and fiction to such a believable degree the audience sometimes couldn’t tell which was which. That was certainly the case with his second novel, 1957’s immensely popular THE GUNS OF NAVARONE (written with such realistic verisimilitude many came to believe there really had existed such a set of mammoth German howitzer cannons) and WHERE EAGLES DARE - in part inspired by the real life WW2 story of British actor Clifton James impersonating Allied General Montgomery in order to mislead Axis intelligence as to D-Day’s invasion site. 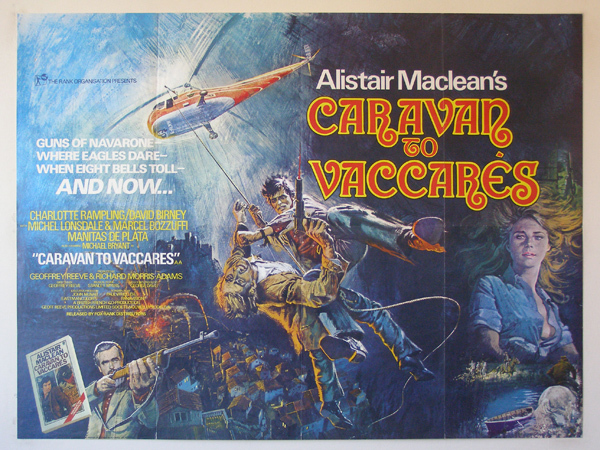 When NAVARONE was turned into an acclaimed film in 1961 starring Gregory Peck, Anthony Quinn and David Niven, MacLean became one of the first “super novelist” celebrities, predating later heir apparents like Crichton, Stephen King, Clive Cussler and J.K. Rowling. NAVARONE would also kick off the popular 1960s “impossible mission” adventure genre, with later films such as THE DIRTY DOZEN, OPERATION CROSSBOW, and even television’s MISSION: IMPOSSIBLE following it’s paradigm structure of a small group of professionals (each with a particular “craft” specialty) thrown together for the common good. MacLean’s novels fall into three sub genres - 1) the Maritime and / or WW2 thrillers, 2) the Spy / Espionage thrillers and 3) the Terrorism / Techno thrillers. While NAVARONE, EAGLES and others (ICE STATION ZEBRA, FORCE 10 FROM NAVARONE, SAN ANDREAS) occupy the first category, his spy thrillers were equally as popular. Unlike Ian Fleming’s “larger-than-life” James Bond sagas, MacLean’s excursions into espionage (THE BLACK SHRIKE, THE SECRET WAYS, PUPPET ON A CHAIN, and even the western-set BREAKHEART PASS) were more “down and dirty” realistic. Not as broodingly so as contemporary John LeCarre’s TINKER TAILER SOLDIER SPY, but structurally designed less like action/adventure yarns and more akin to bonafied Agatha Christie-style “whodunnits” with twisty-turvy plots, divided loyalties, traitors within a trusted group, and an often last minute surprise twist throwing the entire narrative into a whole new light. 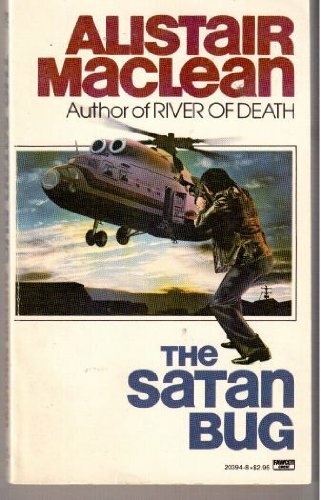 While some fans consider MacLean’s “Terrorism / Techno thriller” phase (begun in the mid 1970s) representative of his weakest output, we disagree. In an era still reeling from a decade of political assassinations, and coping with a new era of world stage terrorism (the Munich Olympics massacre, the abduction of Patty Hearst) and bio-hazard threats (Agent Orange, Love Canal, Three Mile Island), MacLean’s fact / fiction-blend thrillers not only kept pace with the times, but came to define it in popular culture, as the creative arts are apt to do in any era. In the process his novels laid down the modern “techno-thriller” paradigm / structure long before the phrase had been coined, and the genre would follow his narrative model the next 40 years. 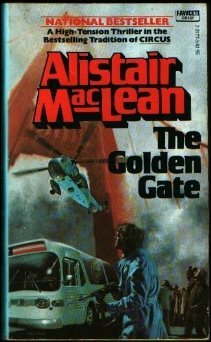 One of the best of this cycle is THE GOLDEN GATE (1976), wherein the Presidential motorcade is halted in the middle of the Golden Gate Bridge, the President and two Arab leaders are taken hostage, and the bridge wired to explode. Making the world think it’s a political kidnapping / statement, the kidnapping is actually a multi-million dollar money making scheme carried out by a former intelligence operative. The “fly in the ointment” of this master plan however turns out to be a supposed lowly TV news cameraman hostage who begins launching a surreptitious counter plot, cleverly taking out the kidnappers one by one. If this sounds familiar it’s because the 1988 film DIE HARD is a near narrative structure duplicate. DIE HARD the film was directly based on the 1979 Roderick Thorpe novel NOTHING LASTS FOREVER, itself a sequel to Thorpe’s 1966 novel THE DETECTIVE - made into a 1968 film starring Frank Sinatra. In NOTHING LASTS Thorpe’s DETECTIVE urban cop character, Joe Leland, comes to LA during Christmas to visit his estranged daughter, Stephanie Gennaro, at the Klaxon Oil Building where she works. 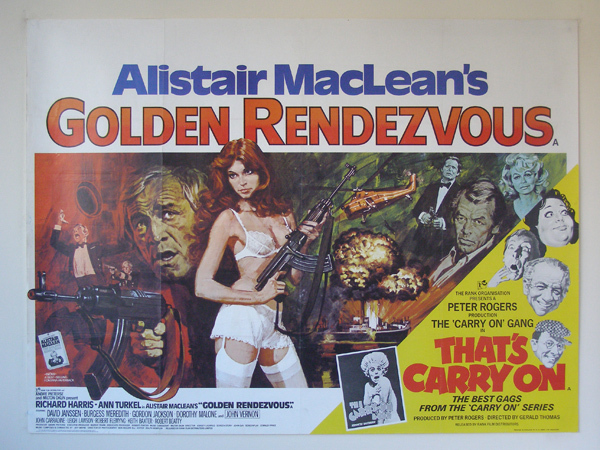 When the high rise is taken over by killers under German terrorist Anton “Little Tony” Gruber, Leland launches a GOLDEN GATE-like counter plot taking them out one by one. 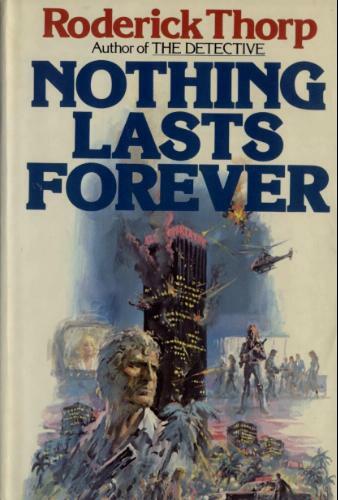 While Thorpe says his initial inspiration for NOTHING LASTS came as a result of watching the THE TOWERING INFERNO then having a dream about gunmen in such a building, it’s obvious the novel’s (and subsequent film’s) structure owed more than a passing debt to Alistair MacLean. In fact we’ve always suspected that (while never hearing anything officially to the effect) the changing of the hero’s name from Leland in the novel to “McClane” in the film was an acknowledgement of this fact. Other DIE HARD “rifts” such as Andrew Davis’ enjoyable UNDER SIEGE (1992) - with Steven Segal as the “supposed lowly cook”, also follow the techno-terrorist narrative paradigm laid down earlier by MacLean in novels like GOODBYE CALIFORNIA - 1977 (Islamic extremists kidnap scientists, steal plutonium, take over a nuclear power plant, then plan to detonate “home-made” subterranean atomic weapons within California’s fault lines); ATHABASCA - 1980 (mercenaries lay siege to the Alaska oil pipeline network) and FLOODGATE - 1983 (wherein political activists threaten to destroy Holland’s dikes). 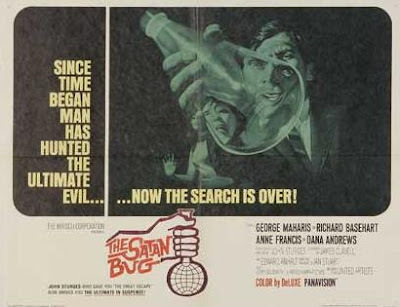 The earlier THE SATAN BUG (1962) was MacLean’s “in-between” transition from spy genre to techno-terrorist thriller. There are however some differences between the 1962 novel (later printings published under his actual name) and 1964 film. The book takes place in Europe (the facility from which the vials are stolen a ringer for Britain’s real life “Porton Down” bio-tech labs), and the hero Pierre Cavill is a former French intel operative pressed back into service by Mi6 “Special Branch”. But much of the narrative tent pole events as well as character relationships and purposes are kept in tact … right up to and including the film’s recreation of the novel’s “fight within the helicopter” climax. Directed with clinical precision by John Sturges, it was his third film for the Mirisch Corporation (released through United Artists) after THE MAGNIFICENT SEVEN (1960) and THE GREAT ESCAPE (1963). Sturges would also helm the James Garner / Jason Robards Wyatt Earp western HOUR OF THE GUN (1967) for Mirisch, then return to MacLean territory with the popular ICE STATION ZEBRA in 1968. A factor in THE SATAN BUG’s unfortunate descent into cinematic obscurity was that it went unreleased in any home video format until it’s 1996 widescreen MGM/UA laserdisc debut. Until then it was at the top of many critics and fans’ “Films We’d Most Like to See On Video” list. The gorgeously mastered laser disc also featured a stereo audio track of composer Jerry Goldsmith’s muscular atonal score … though a few of the segments also featured a smattering of distracting sound effects. TCM (Turner Classic Movies) would use this same master for subsequent broadcasts of the film over the next few years. And the film would see it’s first DVD release in 2007 in Denmark and Norway. But while an anamorphic presentation, the quality of the DVD presentation was sorely lacking. And unfortunately this would be the same sub-standard master used for MGM’s 2010 mail-order only Limited Edition Collection DVD-R version - the viewer greeted with the disheartening pre-movie disclaimer “This film has been manufactured using the best source material available”. With the success of both Warner and MGM’s “limited edition” mail order runs, the studios have promised to give some of those titles a larger more general DVD (and maybe even Blu-ray) release. Hopefully if THE SATAN BUG ends up as one of them, the studio will invest in it’s restoration. at last made it to any contemporary home video format. Peruse any of the online movie message boards and / or sites, and you'll realize it's debut is something for which fans of MacLean and Sturges’ “overlooked little suspense gem” are eternally grateful.